In May of 2015, a group of anti-foreigner demonstrators took to the streets of Akihabara to protest the presence of foreigners in Japan. This was not allowed to continue quietly. A group of otaku organized a blockade on Craigslist. They refused to let racism and xenophobia take root in their beloved Akiba. Wielding signs that read “Otaku Against Racism,” “Anime Creator Against Racism,” “Racist Go Home, “Nazi Go Home,” “No Hate In Akihabara,” “Shame On You,” and “Otakuism Has No Borders,” they took to the streets en masse to block the advance of the anti-foreigners. Their message was clear: Akihabara is a place for love and passion, not hate and cynicism; and the concept of “otaku” knows no race and knows no nationality. Otaku know what it’s like to be vilified, scapegoated, and subjected to harmful stereotypes, and they weren’t about to let that happen to another group who have done nothing wrong. 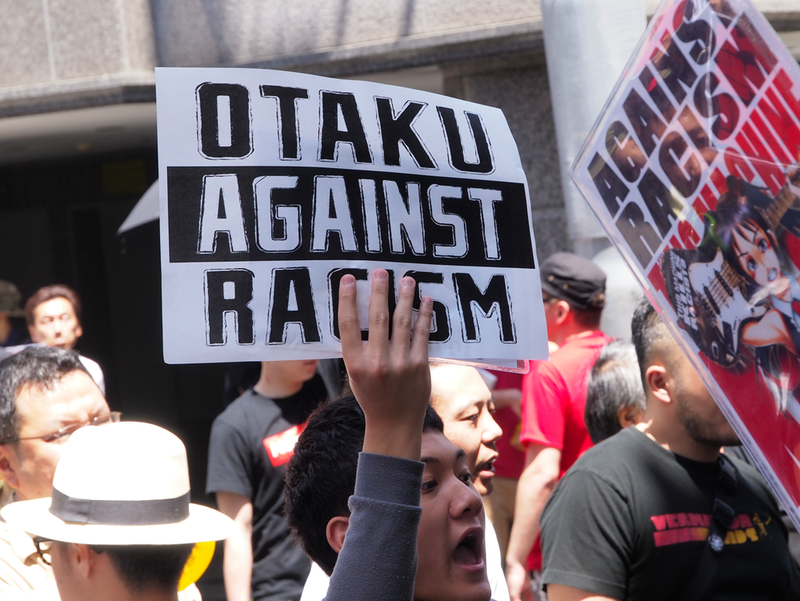 The idea of politically-active otaku might seem alien to those who are used to the common media portrayal of otaku, but it’s part of a reality around otaku that isn’t often touched on. Within the anti-otaku sentiment cultivated by the media in the wake of the Tsutomu Miyazaki and (to a lesser extent) Kaoru Kobayashi killings, there is no room for a portrayal of otaku as politically-active, socially-liberal, and generally not evil. The stereotype of the overweight, socially-awkward, loser male otaku commonly found in news media and in more cynical works portraying otaku is an easy target and easier to portray as a problem. In reality, there are otaku businessmen, otaku politicians, and otaku scholars. In reality, female otaku have made up most of Comic Market’s artist attendance for most of the convention’s history, and often make up more than 50% of the convention’s general attendance. Patrick W. Galbraith’s 2012 book Otaku Spaces takes an intimate look at the rooms and collections of several otaku. The book’s subjects run a gamut: Men, women, students, freelancers, professionals, people in the 20s, 30s, 40s, figure collectors, cosplayers, doujinshi artitsts, fujoshi. Among them are Yuichiro Nagashima, a K-1 fighter infamous for entering the ring dressed as female anime characters, and Danny Choo, a businessman who, among several other endeavours, works with the Japanese government to promote Japanese content and pop culture worldwide. Gainax’s 1991 OVA Otaku no Video interspersed its main story with live-action interview segments called “Portrait of an Otaku.” In a mock documentary style, the segments presented voice-altered interviews with employees or friends of Gainax, posing as over-the-top stereotypes of otaku: All of them men, many of them overweight, and one of them even shown not-so-subtly masturbating while wearing glasses that supposedly reduce censoring mosaics. Given the prevailing attitude toward otaku and the desire to portray them as a bigger problem than they are, it’s no big surprise that the fake interviews in Otaku no Video are often mistaken for real ones, while the real interviews in works like Otaku Spaces are ignored at worst and unknown at best. Part of it’s a confirmation bias. People who already have a disdain for otaku (Or at least their own concept of “otaku”) are more willing to accept the outlandish representations presented in Otaku no Video’s “Portrait of an Otaku,” and are ignorant to the real-life interviews conducted by people like Patrick W. Galbraith, and the real-life exploits of individuals like politician Taro Aso and businessman Danny Choo. Newer PostWeeb-onomics: Is There Too Much Anime? Older PostWeeb-onomics: What is "Success" For Anime?